NB: I wrote this two days ago and now that I am no longer overcome with/by fury can see it has big holes in it. I am starting to accept that the argument for abstention had some political justification and that my own partial and privileged position has, along with my ignorance, prevented me from understanding the importance of certain dynamics. Thanks to those who have corrected me and I apologise for calling anyone who even knew anyone who was thinking of abstaining a connard. I’m posting it without fanfare as I think it has some merit and also because I want to use it to mark my resignation from my self-appointed role as a commentator on French politics. The fascists lost. That’s by far the most important thing about the French Presidential election. They tried to cheat, hack and smear their way to victory and failed. There is no doubt whatsoever what they would have done with power: installed a regime based on violent repression. I think their defeat is absolutely worth celebrating at a time when so little else is. Nonetheless, 33% voted for a Nazi and twelve million abstained. That’s twice the number murdered in the Holocaust denied by the family and friends of the candidate they couldn’t be bothered to vote against. I understand there were reasons to abstain or spoil one’s ballot but I think they were invalid. Had circumstances been slightly different Le Pen would have won and been in a position to continue the work of her father, who has a direct connection to Vichy and the Third Reich. The Front National is now the main opposition and parliamentary elections could consolidate their position and cripple Macron’s administration. Nonetheless the global far-right wanted another figurehead and they didn’t get one. This is a massive setback for their project. Her victory was in the script. Even my political science masters students saw it as inevitable: Le Pen’s victory would be followed by that of Grillo/Salvini here in Italy, then Germany… Supporters of the far-right on social media are right now hurt and demoralised. Such armchair fascists thought it would be easy. 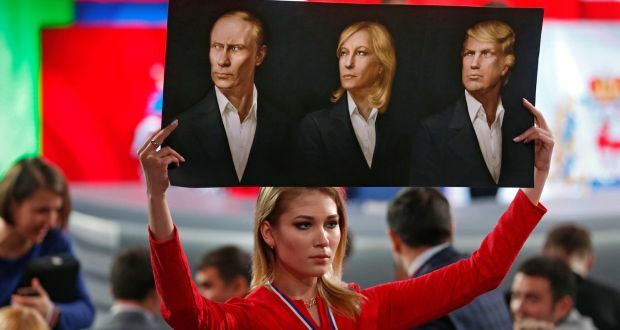 Putin’s photo with Le Pen looked threatening a few weeks ago, a ready-made meme lacking only the cartoon toad; now it just looks like an awkward photo of two arrogant people who probably barely even spoke to each other. As for the Left which actively encouraged people to abstain, I’m left feeling a little like those left-wingers who in previous generations lost faith with Stalinism upon seeing the brutal repression in Hungary in 1956 and Prague in 1968. Just as the initial burst of support for Mélenchon was encouraging, his subsequent abdication of moral responsibility was shocking. Le Pen could actually have won. Macron had no automatic base of support. The establishment right could have swung over (I don’t think by the way they would have supported Mélenchon). An opportune terrorist attack could have created a bloodthirsty atmosphere which Le Pen would have luxuriated in. The desperate attempts at hacking (seemingly started by the US far-right with Russian assistance and then actively promoted by Wikileaks) could have been better coordinated and might have worked. Perhaps a fascist government wouldn’t have damaged the immediate life chances of the teenage edgelords running round Paris last week, but overnight the plight of refugees would have worsened immeasurably and the whole infrastructure of human rights, climate action and international cooperation per se would have collapsed. I find the lack of solidarity with fascism’s potential victims contemptible. Credit to those Mélenchon voters who voted for the centrist to stop the fascist at a time when the arrogance and delusion of a generation of failed left leaders was on unproud display. On the other hand, Macron (as everyone in the world knows) is a ‘Neoliberal’. This week I got my students to study his English in the form of a BBC interview about what he stands for. He produces neoliberal buzzwords like a windup toy: Innovation, Competition, Markets, Reform, Liberalisation… Nevertheless, he is a highly contradictory figure: he’s also instinctively and consistently socially progressive. His comments on French colonialism in Algeria were principled and brave. To dismiss him as a mere apparatchik of a soviet-style regime is misleading and unfair. Neoliberalism is not a monolith and in any case an appreciation of the role of markets doesn’t make you a neoliberal zealot. If the French Left were to ease off on using that deeply problematic term they could choose to view him as a social democrat and put pressure on him to behave as such. Such an idea won’t go down well with those who insist that there is no difference between capitalism and fascism, between a ‘banker’ and a Nazi. The notion that voters are being ‘blackmailed’ between the two plays into the hands of the far-right. Žižek argues that we are all being held to willfully held to ransom by an elite and that we should refuse their terms, an argument that quickly gained currency. In reality it’s a deadlock, one in which progressives are objectively forced to join forces with all those opposed to fascism, even those who we judge to be responsible for its resurgence . Evidence of the folly of the blackmail thesis is is all over social media in the form of increasing crosspollination in the discourses of the far-right and the far-left. From pro-Brexit Labour supporters to Jill Stein fans and supporters of Mélenchon I’ve detected a confluence with the far-right, particularly in the escalation in attempts to be seen as something other than ‘liberal’. This is a zero sum game in which only the only winner is the far-right. The frequency with which the antisemitic canard of Rothschilds has been pointedly evoked reveals undertones of anti-semitism. I’ve always rejected the notion that the two ends of the political spectrum meet up, but thanks partly to the inanity of online political ‘debate’ that dismissal is becoming more and more valid. Some times over the last few weeks I’ve found myself thinking: if this is the left, maybe I no longer want to be part of it. But then as a friend sagely retorted when I put the thought to her, where else are we? As a result I’ve finally come round to thinking of it as no longer a helpful category. We need to know who’s really on our side, who we can trust in a context where political feelings are subject to massive manipulation. This has to be the last time that anyone pays any attention whatsoever to Wikileaks. Žižek’s ulraleftist posuring demonstrates yet again that, just as he argues in relation to poets, philosophers don’t make good political leaders. People like him are far too given to iconoclasm and provocative thought experiments. Nor are his political prescriptions plausible: for all his edgy neomaoist statements about divine revolutionary violence, his actual political interventions have tended to be reformist in nature (for example DIEM 25). We progressives also need to accept that Facebook is not our friend. To quote a former executive for the company, by flicking a switch they can change the results of elections. We are just beginning to understand (too late) how insidious microtargetting is. Monstrously powerful far-right interests are able to tap with eerie precision into secret wells of resentment beneath the surface, to direct psychopathological undercurrents in directions which serve their requirements. Anyone who has not done so needs to read Carol Cadwalladr’s terrifying and riveting piece on just how connected, powerful and pernicious the digital far-right is. Companies like Cambridge Analytica may well be the most dangerous forces on the planet. As repression and manipulation heat up degree by degree in step with the warming climate, we will need to stay out of the hothouse of social media, where our worst innermost fears and recriminations are being cultivated in a way that makes Soylent Green look like a children’s TV cartoon. I think the global priority for progressives must be to crush the far-right, to humiliate them as Macron did so well in the debate. We have to insist that our media ostracise them rather than allowing them to present themselves as normal. Just as Daesh and their followers are not given access to the airwaves or granted debating rights, our homegrown extremist terrorist organisations should not be either. Europe’s equivalents of Isis are also agents of Putin, who the results of the last few elections (Austria, The Netherlands, France) is far less omnipotent than he and his acolytes pretend. In some ways Putin’s Machiavellianism is a busted flush. Macron’s team’s way of dealing with the hacking was a masterpiece of defusing a powerful weapon and will make it far harder for Putin and his acolytes to manipulate public sympathies via spectacular leaks. The world is facing a confluence of massive crises and life cannot go on as it is. Nevertheless, as Paul Mason argues, Macron’s victory is evidence that racism need not be a inevitable defining element of the future. To fight back against the forces of the far-right I think we have to (regardless of its complicated history), make full use of the term ‘progressive’. What exactly that term means is not a question that cannot detain us. On certain shibbloths of the left we we will have to accept differences of opinion. There are specific things we could all agree on, unambiguously progressive causes: Climate change, an alternative to a growth-led economic model, an end to the power of fossil fuel companies, internet privacy and much more. I find much to recommend in Yanis Varoufakis’ thesis that it is the job of progressives to save liberal capitalism from the extreme neoliberals. Markets do have a part to play in the economy but the idea that they are always the answer has no credibility. Neither do protectionism and nationalism: some form of social democracy is probably the best we can hope for, and in order to achieve or hang onto it we have to insist on human rights, the primacy of the environment, democracy, and freedom of the press. Protecting the media from political and commercial corruption means subscribing to publications which we consider important. How does a progressive movement relate to those who are righteously angry about the role and rule of the banks? I don’t know. But as Sunny Hundal points out, contemporary political affiliations are not just about the economy. We can partly undermine the appeal of the far-right, to challenge its self-portayal as voice of the economically disenfranchised, by constantly exposing its contradictions and compromises, emphasising that the Le Pens and Trumps and Farages just represent a deeply corrupt and illiberal elite. While it’s not a question of mounting a naive defence of the EU as perfect, we can also recognise the efforts of politicians like Merkel in trying to stand up for immigrants. Although this is a defensive battle we must also make clear that we have aspirations to a world which is better than this one, as distant as such a prospect may appear. In doing so we can’t adopt populist language: no sneering at ‘liberals’ and ‘cosmopolitans’. Liberalism is not our enemy. Our foes are Trump, Putin, Le Pen, Erdoğan, Farage, May and all others like them. There is now a broad global movement based on hostility to democracy and liberal values, on racism and climate denial. The opposition to it needs to involve everyone who understand that those things matter, that we live in the space between democracy and fascism. If we allow ourselves to think, as I have seen some argue in nominally progressive fora over the last few weeks, that we already live in a fascist society, then all is lost. Such attitudes are a form of slow suicide. Democracy may in some ways be a facade, but it’s a facade which protects us from the elements in stormy times. It needs to turn itself into a social institution. It should be providing welfare rights advice to those whose benefits are being cut, legal support to tenants battling greedy landlords and arguing with the utilities to provide cheaper and better deals. Sounds daunting, but we don’t have a choice.